24/7 immunity from lethal diseases? It’s in the bat, man! An Australian black flying fox hanging out with friends. Bats are really, really good at carrying disease. 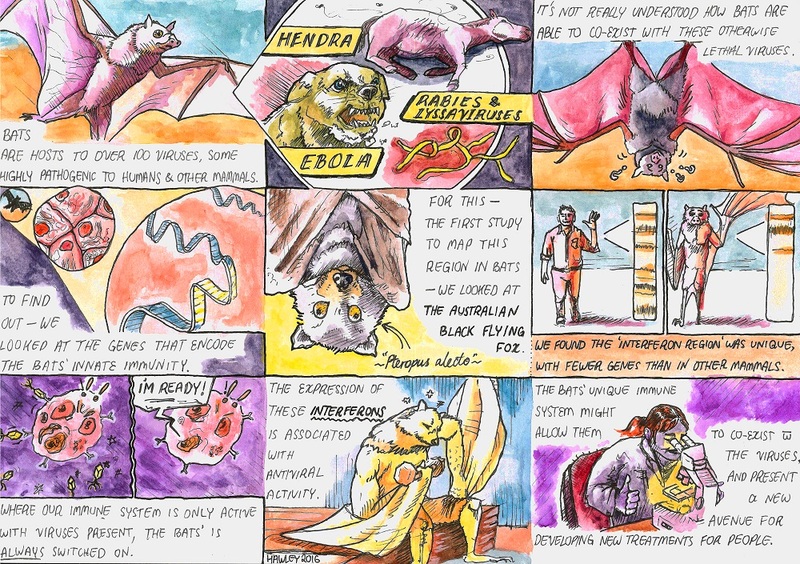 From rabies to Ebola to Hendra, our flying friends have evolved the ability to host – but remain unaffected by – dozens of nasty bugs that can spell death for us humans. It’s a skill that you could easily file next to ‘fleas; bubonic plague’ and ‘reality tv; celebrities’ as some of the greatest past and present potential threats to humanity. But unlike, commercial reality television, there are learnings we could take from bats and their disease carrying capability to that could, someday, actually improve our lives. And it’s all to do with immunity (no, Survivor fans, not that immunity). We know that bats are a natural host for more than 100 viruses, many of which are lethal to humans and other animal species… so why don’t they get sick, too? 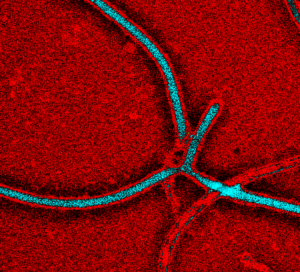 Ebola virus, one of the many nasty viruses bats can carry. “Whenever our body encounters a foreign organism, like bacteria or a virus, a complicated set of immune responses are set in motion: one of which is the defense mechanism known as innate immunity,” explains our leading bat immunologist, Dr Michelle Baker. But unlike humans, bats have their ‘innate immunity’ switched on all of the time, protecting them from the very viruses they’re carrying. 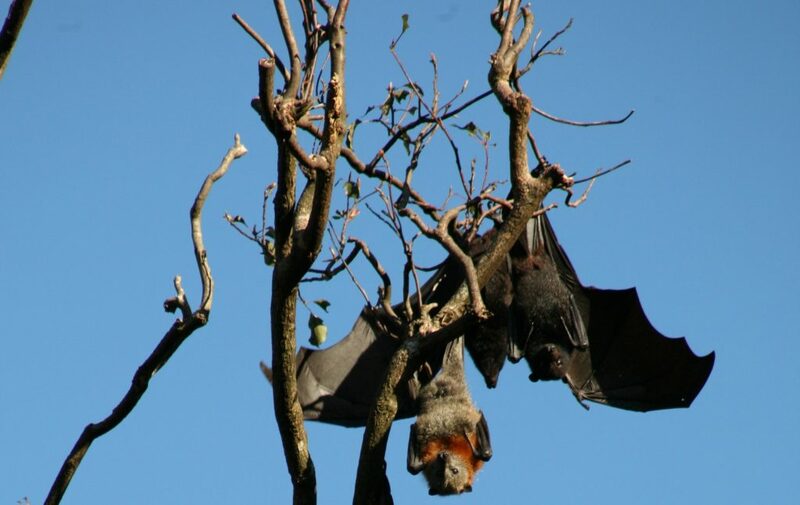 In a paper published today in the Proceedings of the National Academy of Sciences (PNAS), Michelle and her team of biosecurity scientists examined this evolutionary cheat code in the Australian black flying fox. “We focused on the innate immunity of bats, in particular the role of interferons – which are integral for innate immune responses in mammals – to understand what’s special about how bats respond to invading viruses. The team also compared two type 1 interferons – alpha and beta. The research showed that bats express a heightened innate immune response even when they were not infected with any detectable virus. “Unlike people and mice, who activate their immune systems only in response to infection, the bats interferon-alpha is constantly ‘switched on’ acting as a 24/7 front line defence against diseases,” Dr Baker said. We already know that bats play an important role in their ecosystems, as both pollinators and insect controllers, but Dr Baker and her team are excited by their potential worth in helping protect people from infectious diseases. This is just one of the many amazing projects we’re currently working on in the health and biosecurity field. To find out more, visit our website. Using herpes virus to eradicate feral fish? Carp diem!